A serving police officer has been killed in a crash while off-duty. 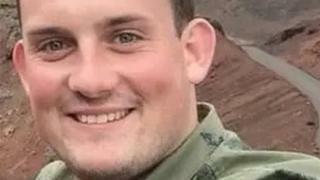 PC Daniel Clayton-Drabble died after the crash on a road near Whittlebury in Northamptonshire at about 07:40 GMT on Boxing Day. The Thames Valley Police officer, aged 24, was based at Milton Keynes police station. Det Ch Supt Gilbert Houalla said: "This is a tragic incident and our thoughts are with Daniel's family and colleagues who are being supported at this time." An investigation into the crash is being carried out by Northamptonshire Police. No other cars were involved and PC Clayton-Drabble's next of kin had been informed, Thames Valley Police said.